Objective: Gastroesophageal reflux disease (GERD) is frequently associated with obesity (BMI>30), being reported in up to 51% of patients. The optimal surgical procedure for the combined treatment of morbid obesity and GERD has yet to be defined. 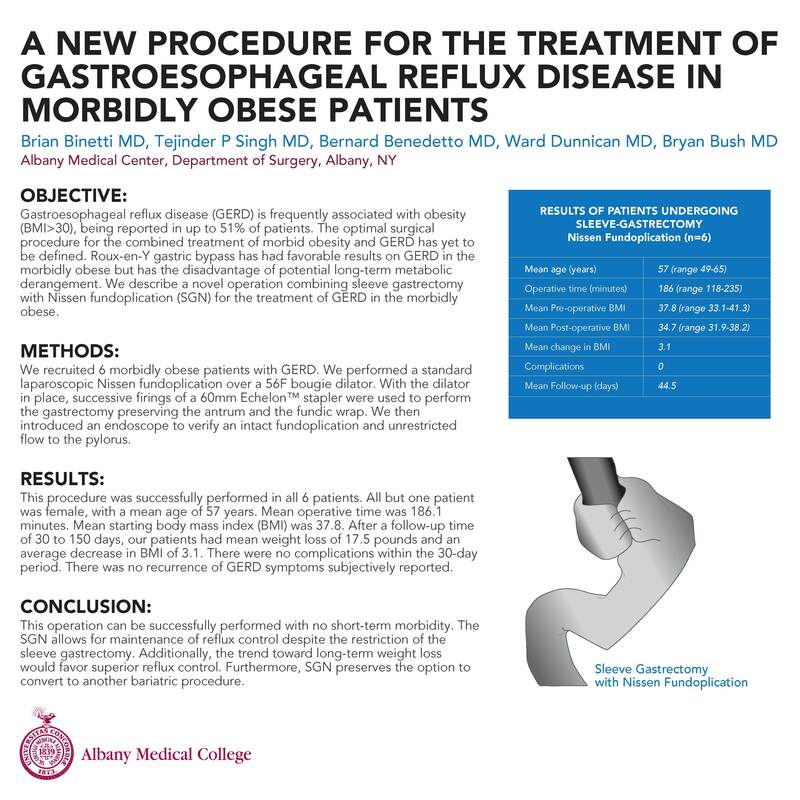 Roux-en-Y gastric bypass has had favorable results on GERD in the morbidly obese but has the disadvantage of potential long-term metabolic derangement. We describe a novel operation combining sleeve gastrectomy with Nissen fundoplication (SGN) for the treatment of GERD in the morbidly obese. Methods: We recruited 6 morbidly obese patients with GERD. We performed a standard laparoscopic Nissen fundoplication over a 56F bougie dilator. . With the dilator in place, successive firings of a 60mm Echelon™ stapler were used to perform the gastrectomy preserving the antrum and the fundic wrap. We then introduced an endoscope to verify an intact fundoplication and unrestricted flow to the pylorus. Results: This procedure was successfully performed in all 6 patients. All but one patient was female, with a mean age of 57 years. Mean operative time was 186.1 minutes. Mean starting body mass index (BMI) was 37.8. After a follow-up time of 30 to 150 days, our patients had mean weight loss of 17.5 pounds and an average decrease in BMI of 3.1. There were no complications within the 30-day period. There was no recurrence of GERD symptoms subjectively reported. Conclusion: This operation can be successfully performed with no short-term morbidity. The SGN allows for maintenance of reflux control despite the restriction of the sleeve gastrectomy. Additionally, the trend toward long-term weight loss would favor superior reflux control. Furthermore, SGN preserves the option to convert to another bariatric procedure.